Uha uha - så er jeg med i mit første Design Team New Year Blog Hop, der begynder nu og slutter den 9. januar 2011. Hvis du er kommet fra Bev's blog er du det rigtige sted, hvis ikke - gå til Pattie’s Creations Design Challenge hvor det hele starter. Pattie's udfordring til os i DT var at bruge New Year Champagne Glasses fra Pattie's Creations et eller ander sted på vores kreation. Jeg printede "glassene" ud og farvelagde dem med PrismaColors, men da jeg ikke lige er til Nytårskort - valgte jeg at lave et bryllups kort. Jeg syntes, at det er lidt sjovt at se, hvor meget forskelligt der kan komme ud af det samme "image" så jeg skal selvfølgelig en tur rundt og kigge. Nogle af de andre dygtige medlemmer af DT har måske en ekstra præmie. Næste stop for bloghop er Mel's blog. God tur. Design Team New Year Blog Hop - January 7th - 9th 2011 starts now. "If you arrived here from Bev's blog then you are in the right place, if not go back to the beginning at Pattie’s Creations Design Challenge where it all begins. Some of the other talented girls at Pattie's Creations DT’s are maybe giving away an extra prize. Konkurrence jeg også deltager i.
Linda, what a festive card! I love how you colored my image too. fabulous colours on the glasses.. and great layers on the card. Your card is gorgeous. I just love how you've colored the image. TFS. Really such a lovely card, the colors of the wine glasses are so appetizing.............lol , good work !! Wonderful card! Love that layout you used too. Great! Love the beautiful colors you have used here, and the gorgeous papers. Nicely done! Love how you've colored Pattie's image! Great job. Hi Linda! Don't know what you said, but I just love your card. All the gold and silver and the way the paper is laid out and the confetti drifting down. Love it!! Oh, Linda this looks beautiful. I love all the layering and the colouring is great! Lovely card and a great way to celebrate! Happy New Year! 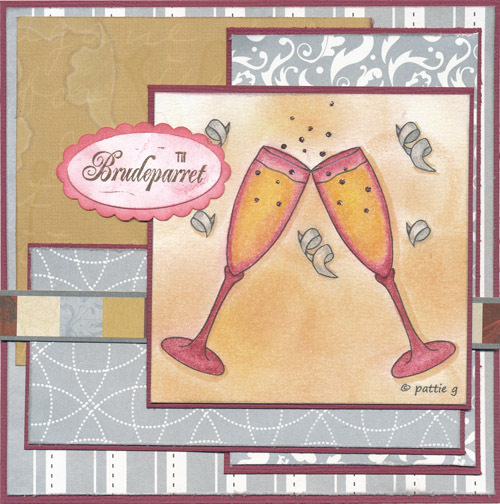 Beautiful card Linda....the papers and colors you went with add a real touch of elegancee to it. Thank you so much for sharing. Great card love the stamp. Thanks so much for joining us over at Wild Orchid Crafts sketch challenge.